Every football fan faces the same challenge as they enter adulthood: finding the right balance between sporting your team’s colours and avoiding full-kit w**ker status. Only when you’ve sat in the pub and witnessed an obese middle-aged man wearing a shirt with ROONEY written on the back do you realise; adult football shirts are not always a good choice for the fashion conscious fan. How then, does any self respecting fan display their team’s pride without compromising their style? There are a multitude of official t-shirts, polos and other clothing items sold by every team imaginable, but very few items ever tick both boxes. Whilst there are bargains to be had, most team merchandise ends up scrunched up at the back of the wardrobe never to be worn again. So, with the World Cup approaching and England’s official shirt retailing at a ludicrous £90, what other options are there for embracing Brazil 2014? 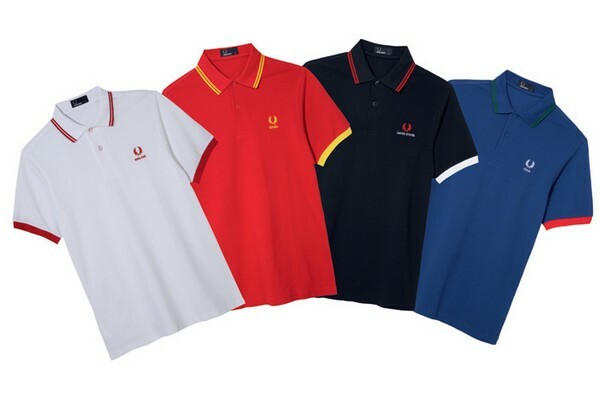 Polo shirts are more often than not the best bet for those looking for a stylish, yet football themed shirt and thankfully, Fred Perry have come to the rescue once again. The success of their 2010 World Cup style polos has seen the range return for this summer’s upcoming tournament, providing football fans with a chance to display their countries colours in a much more refined way. Fred Perry have released 10 of these themed shirts, featuring England, Brazil, Spain, Japan, France, Italy, Portugal, Holland, Germany and the USA. Each shirt is stylishly emblazoned with the team’s colours and features the name of the country stitched below the Laurel Wreath for extra clarification. England’s shirt is the standard white, but with a subtle red trimming and will blend in brilliantly with the sea of red and white you will likely encounter whilst watching Three Lions games. However, unlike many of the other England shirts available, this one can still be worn confidently on a night out after the inevitable failure of the team in Brazil. The shirts are perfect not only for those feeling patriotic, but also for people wanting a World Cup memento that won’t simply be stored away forever once the tournament is over. The one downside to the collection is perhaps the limited selection of countries available, as 10 represents under a third of the teams actually competing in the finals, meaning the eventual winner might come from elsewhere. The polos retail at £60, which when you factor a £30 difference from the new England shirt, actually becomes quite reasonable. So for anybody looking to enjoy the World Cup in style, look no further than the new Fred Perry range. Next article“I woke up like dis” (No, seriously).